We’re living in a world full of contraptions that were once considered futuristic concepts. For audio lovers, this is a particularly exciting time. With the development of digital audio technologies, we’ve experienced incredible reductions in physical device sizes, while data storage capacities have increased greatly. More recently, wireless technologies have enabled audio to be transmitted from source to speakers without cables; however, many of us may be confused by the many wireless audio options that are available. This article will hopefully help clarify the differences among the various technologies and may serve well as a platform for further research. Despite many differences, all wireless audio systems share some common components: an audio source (this can be a Radio, a television, a stereo receiver, a smartphone, really anything that has an audio out or headphone jack), a transmitter, a receiver, and an audio amplifier. The audio source is the device that contains the audio signal. The transmitter receives the audio signal from the source and then transmits the signal wirelessly. The receiver picks up this wireless signal and passes it to the audio playback device which plays the signal back as audible sound. Keep in mind that wireless audio technologies deliver audio signals, not power, wirelessly. Depending on the design, wireless audio devices may be powered with batteries or with a power cable. FM transmitters are great devices that serve a wide variety of applications. These devices are typically connected to the headphone jack (or audio output jack) of an audio source and are able to transmit the audio on vacant FM frequencies. These wireless FM broadcasts can then be received by any FM radio. FM transmitters are very popular due to their ease of use and wide compatibility. The audio quality provided by FM transmitters is limited compared to other technologies. Top-notch FM transmitters may offer a frequency response of 30Hz to 15kHz. The operational range (i.e. broadcast distance) of FM transmitters varies. Some are low powered and will only transmit audio a few yards, while others may be able to transmit a signal 50 feet. The FCC places limits on the output power for these devices to prevent interference with licensed FM radio stations. The FCC output power limit is 250 Micro Volts at three Meters. FM transmitters are often used to transmit audio from source devices like MP3 players, satellite radio receivers, etc. to car stereos, home theaters, or portable radios. Many times they can be found in gyms or fitness centers where they are used to transmit audio from televisions. People who are exercising simply tune their radios to the FM frequency listed below each T.V. to hear the audio. One point of confusion that often exists, is transmitting an AM signal over FM. The transmitter doesn’t “care” what is on the audio signal, it just uses the FM frequency band to send that signal to other devices on that same frequency. One of the greatest benefits of FM transmitters is the fact that the transmitted audio signal may be received by any and all FM radios within range. As far as the radios are concerned, they are receiving an FM signal just like a normal FM radio station. Bluetooth is a wireless technology that uses radio signals in the 2.4GHz band to transfer small amounts of data wirelessly over short distances. While Bluetooth can transmit various types of data, we will focus on its usefulness for wireless audio. Many new mobile devices like tablets, smartphones, MP3 players (etc. ), may already have Bluetooth communication technology built in. These devices are also capable of storing music or audio files, thus making them “audio source devices”. These Bluetooth devices may actually perform two functions of our wireless audio chain: the source and the transmitter. There are also Bluetooth transmitter devices which may be connected to the headphone jack of an audio source to transmit audio to a Bluetooth receiving device. Bluetooth audio receivers are available in various forms. They may be devices which can be connected to input jacks on (non-Bluetooth) playback devices like home stereos, amplified speakers or headphones. Other times, they may be devices which are consolidations of Bluetooth audio receiver and playback device. These are typically stereos, amplified speakers, headphones, radios (etc.) which have integrated Bluetooth audio receivers. Providing 20Hz-20kHz frequency response, wireless Bluetooth audio offers better audio quality than FM transmitters. The operational range is about 30 feet with clear line of sight. A neat feature about Bluetooth is that because it can transmit data other than audio signals, it is possible for Bluetooth receiving devices to offer control of audio content such as fast-forwarding/rewinding, song skipping, pausing etc. Most people familiar with Bluetooth may have seen the technology used in wireless earpieces for cell phone calls. (Some of us may just wonder why so many people seem to be talking to themselves nowadays.) Bluetooth is also used for mobile or home speakers systems. Since many new audio source devices (smartphones, MP3 players, tablets, etc.) feature Bluetooth technology, Bluetooth speakers offer a convenient and widely compatible way to playback audio without requiring special (proprietary) adapters, connectors, or docking mechanisms. This is one of the greatest strengths of Bluetooth technology in regards to audio. Due to the 30ft range of Bluetooth, audio products using this technology are typically optimized for single room (close range) environments. If you’re not familiar with the term “WiFi”, please click the link above to learn more. In regards to audio, WiFi offers the same provisions as Bluetooth, but the operational range is usually about 250 feet with clear line of sight. Compared to the mobile benefits of Bluetooth, WiFi is typically more of a home-based technology that is able to connect multiple devices together to form a network. This networking ability works out great for setting up wireless audio systems to serve entire buildings. Many people may already have wireless networks in their homes. In these home WiFi networks, multiple computers, laptops, wireless printers, tablets, smartphones, etc. may all connect to a single WiFi router to share data between the devices. Music (or audio files) stored on one device may be shared via the WiFi network with the other connected devices. 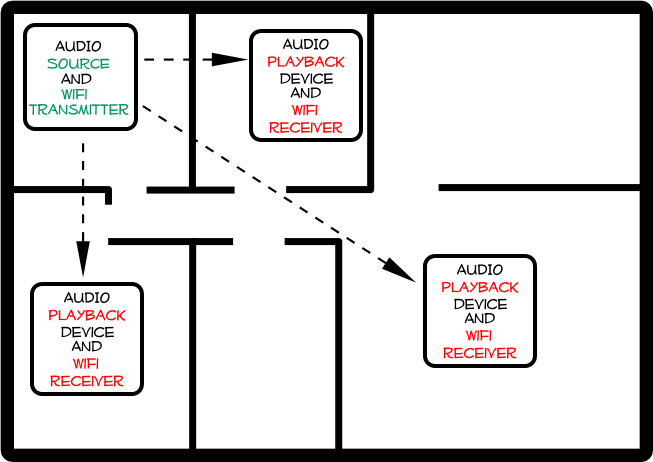 WiFi audio products follow the same basic signal chain as the other wireless audio technologies. WiFi audio source devices, WiFi audio transmitters, WiFi audio receivers, and WiFi audio playback devices are all available. Generally speaking, WiFi source devices are typically also transmitters. WiFi enabled playback devices (speakers etc.) are typically also receivers. As with Bluetooth, there are also separate WiFi transmitter or receiver adapters which can be connected to external sources or playback devices. Some audio companies make wireless audio products which only work with other compatible products made by the same company. These wireless audio products are usually sold as transmitter and receiver kits. 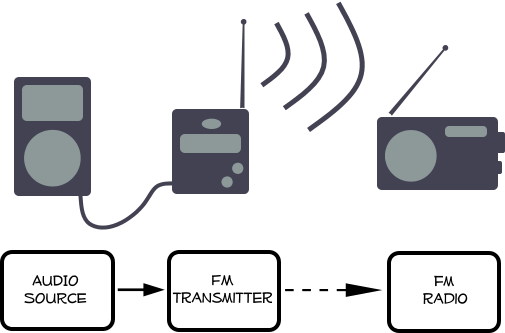 Often times, multiple receivers may be used to receive a wireless audio signal from a single transmitter or source. Products like these, which are only compatible with other products made by the same company, are considered “proprietary”. The benefit of proprietary products is convenience. Since the products are designed to work together, setting up and using the systems is typically an easy process. All of these mentioned wireless audio technologies provide great methods for sharing audio without requiring cables. No matter which type of wireless audio set up you’re considering, the easiest way to understand the system is to consider the signal chain.